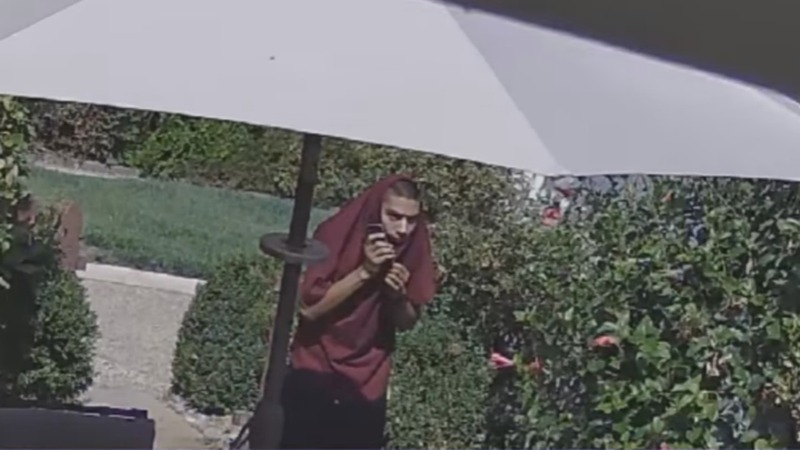 SAN JOSE, Calif. -- San Jose police released video footage Tuesday of a burglary suspect who stole a jewelry box from a home in the Calabazas Park neighborhood of West San Jose in August. The video below shows the suspect ringing the doorbell, scurrying to the side of the house and covering his face. Police say theft took place at a residence in the 1000 block of Windsor Street off of Bollinger Road on Aug. 24 around 10:30 a.m. and that the suspect rang the doorbell to check the home for occupants. When no one answered, he turned around and went to the backyard through a side gate where he was seen covering his face with his shirt. He broke a window to enter the home, ransacked the place and fled through a rear sliding glass door. Police say the suspect set off the burglary alarm with the jewelry box in hand. Anyone with information on the case is asked to call Detective Sgt. Mike Montonye at (408) 277-4401. Those who wish to remain anonymous may call Silicon Valley Crime Stoppers at (408) 947-7867.